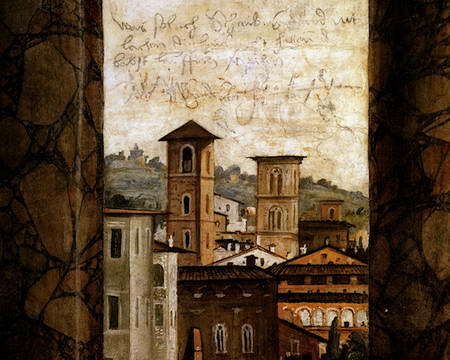 The vast hall on the first floor, where on 28 August 1519 the rich banker held his wedding banquet, takes its name from the perspective views of urban and rural landscapes between fictitious columns, painted by Baldassarre Peruzzi. The artist combined a rich sense of architecture with a gift for perspective and scenography. It represents the ideal continuation of the ground floor loggias; through the imitation columns one can see various views: villages perched on rock, countryside views, and in the background, against an illuminated sky, is the city (The Holy Spirit Church, a Roman basilica, the porta Settimiana). The 1976-83 restoration brought to light the sarcastic inscription in the centre of the wall towards the Wedding Room. The message dates back to 1528 and documents the passage of the Lansquenets in the Farnesina during the Sacking of Rome in 1527: “Why should I who write not laugh – the Lansquenets have set the Pope on the run”. Trompe l’oeil niches with figures of gods complete the decoration and an ample frieze with mythological scenes attributed to Peruzzi’s school runs high up around the walls. The panel over the fireplace, Vulcan’s forge, is mediocre and was probably painted at a later date than the other frescoes.